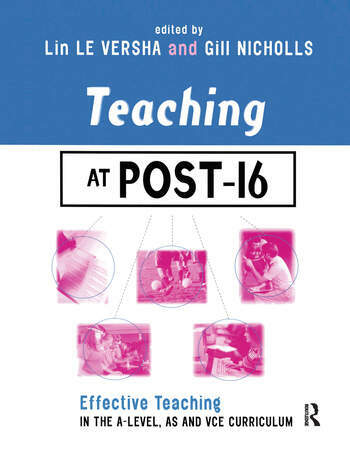 The post-16 sector is the focus of great change in education and this book provides all teaching professionals with a guide to exploring and developing successful teaching in this new environment. With contributions from education experts and subject specialists, this book addresses the issues that now face teachers at post-16. It guides readers through the new requirements in a simple and accessible way; looks at teaching and learning issues in detail and considers the professional development of those teaching at this level. Essential reading for all post-16 teachers in schools and colleges. Part 1 Exploring the theory and context of the post-16 framework: How did the post-16 framework develop? ; Examination and assessment in Curriculum 2000; Key skills in Curriculum 2000; Student guidance and support; Learning styles: adoption and adaptation; Changes post 16 = challenges post 18 - considering the transition years. Part 2 Teaching for learning: Managing students' behaviour in the classroom; Planning lessons to reach all your students; Using questions and group work effectively; Managing coursework and assessment; Dealing with individual needs within the classroom; The implications of the development of ICT for teaching and learning post 16; The personal tutor; Improving performance - external monitoring.